The rapid development of technology and the Internet has significantly changed the way business people communicate. For Small and Medium Enterprises (SME), key factors to stay ahead of the competition include enhanced collaboration between dispersed departments and branches and seamless communications among partners, investors and consumers. Video Collaboration provides face-to-face communication beyond the boundaries of specialized conference rooms, helping your business boost productivity and collaboration. The costs of face-to-face communication add up quickly. There are travel costs (transportation, accommodation and meals), time costs (travel hours that far exceed conferencing hours) and the HR cost of travel and administrative staff. With modern Video Conferencing, easy multiparty collaboration is available from any device in any location. 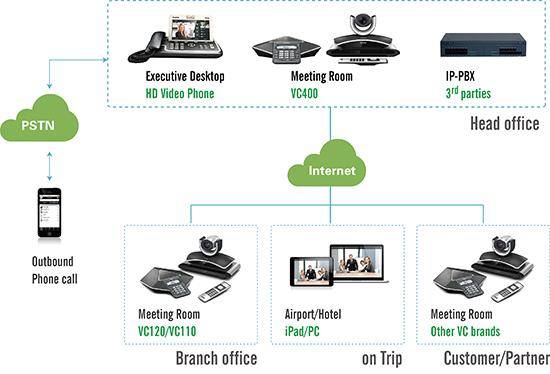 The Yealink video collaboration solution allows business users to enjoy multi-point video collaboration across various web-based environments on multiple devices thanks to its extensive compatibility and flexible interoperability. Designed for SMEs, the VC Series ensures a perfect balance between high quality, ease-of-use and cost-efficiency. ● Adaptive bandwidth and dynamic bandwidth adjustment with an 8% resistance packet loss means that video conferencing runs smoothly in fluctuant network conditions. ● Intelligent firewall support means that plug-and-play is possible without any further firewall configuration. ● Designed to let you access every function with the ease of a smart phone so that almost all operations can be carried out in just three simple steps. ● Dual H.323 and SIP protocols ensure good compatibility with mainstream video conferencing systems and endpoints. ● Interoperability with videophones, tablet PCs and smart phones means that users have easy access to video conferencing at any time and place.